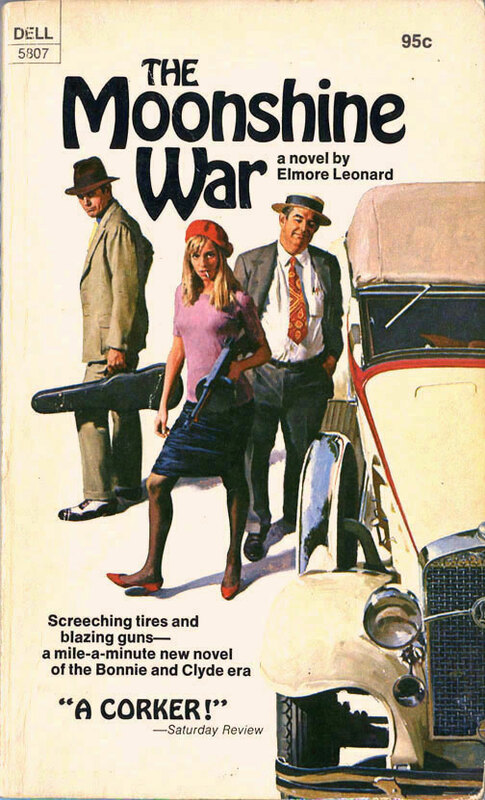 As mine does, making it very rare indeed: there are about fifteen or so signed copies of The Moonshine War for sale online across all editions, but only two of those are 1970 Dell paperbacks. 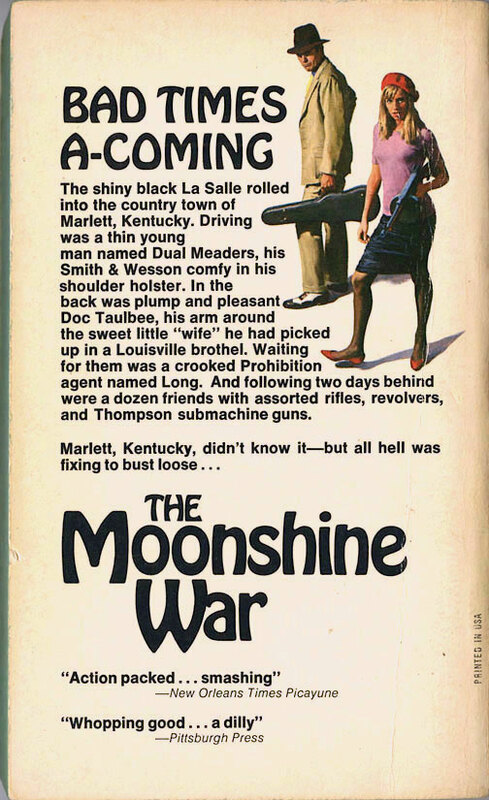 Anyway, having now read The Moonshine War, I wouldn't say it's a transitional book in terms of style or tone; with its (seemingly) naturalistic dialogue, lightly sketched but convincing characters and bare bones plot, it's very much an Elmore Leonard novel of the second phase of the writer's career, in the mould of, say, Mr. Majestyk (1974) or Valdez is Coming (1970): a story about a man – in this case deep south bootlegger Son Martin – who takes a stand partly because it's the right thing to do, partly on principle, but mostly just because. That streak of obstinacy is even wider in Son Martin than in Vincent Majestyk or Bob Valdez, however; Son manages to alienate – and even make enemies of some members of – an entire community, including his lover, hotel owner Kay Lyons, all to protect his late father's buried stash of booze from a horde of hoodlums, led initially by Son's former army buddy-turned prohibition enforcer Frank Long. It's more in the setting that the novel can be seen as a bridge between eras: Kentucky, in the grip of the Great Depression, 1931 – not the wild west (not even geographically), but not quite the modern world either; a place and a time where a family's moonshine still was their only means of support – a situation genially tolerated by the local law, in the shape of septuagenarian sheriff Mr. Baylor. Mind you, if Justified, the TV spin-off from Elmore Leonard's Raylan Givens novels, is anything to go by, not much has changed down south in the intervening years, except that drugs have replaced booze as the local currency. 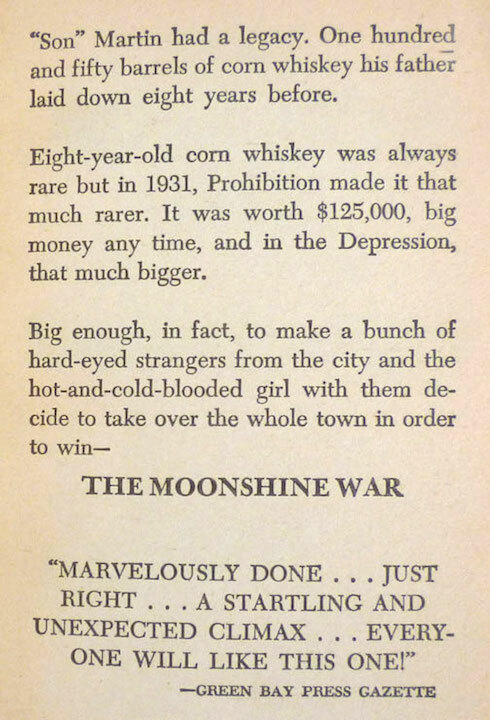 And The Moonshine War is a kind of precursor to "Fire in the Hole" and the Givens television mythology – and attendant novel – that that short story begat, from the playful, probing conversations between Son and Kay, anticipating those between Raylan and Winona, to a mention of Harlan County and even a character with the name of Boyd Caswell – markedly close to Boyd Crowder. 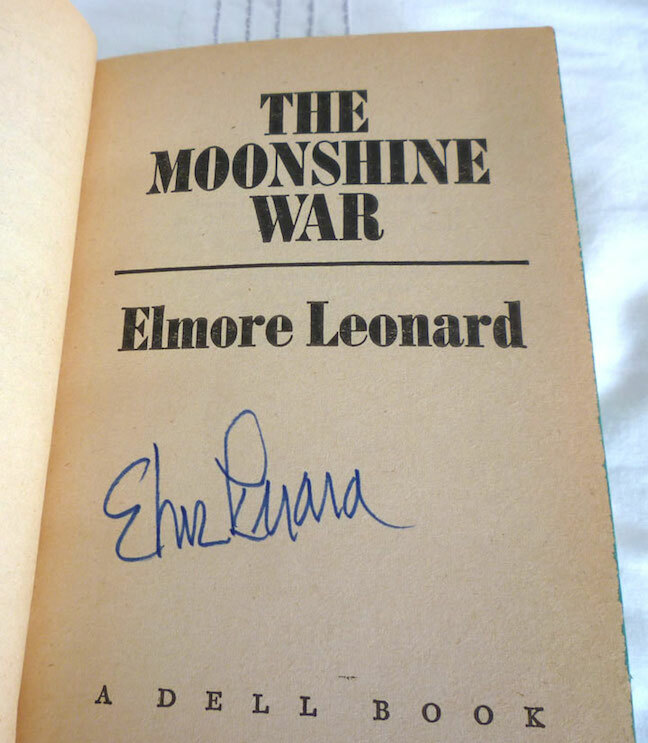 I noted above that copies of the 1970 Dell paperback of The Moonshine War are nowhere near as pricey as either the US or UK hardback first editions; that said, I should point out that I still paid a fair amount for my one: not only is it signed, which automatically increases the price, but it's also not a common edition to come across here in the UK. 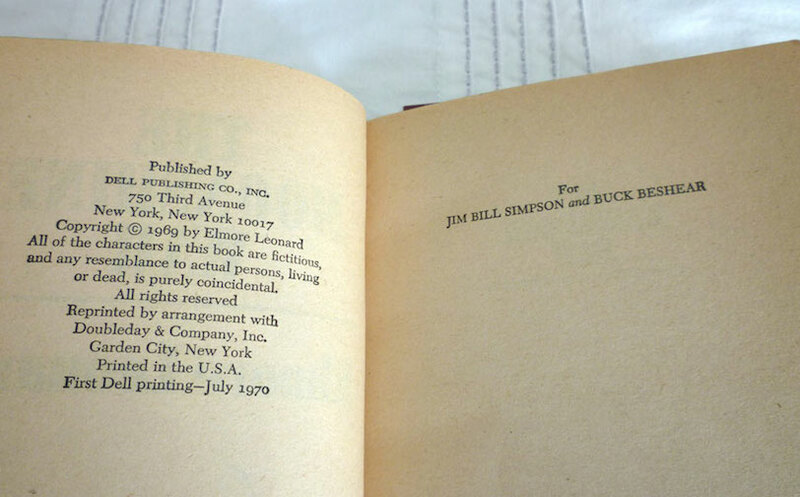 But to sweeten the deal, Adam kindly threw in another signed book – a 1980 first edition of an obscure television tie-in thriller bearing an inscription which, it transpired, boasted a unique association. Great find. That cover design is trying very hard to evoke Faye Dunaway in Bonnie & Clyde. Indeed. It actually looks more like a movie poster than a book cover.